Updated for the November 2015 election! I wrote a live election activity monitor which you can use to see the current status and watch the votes live; it shows the cutoff line for the final phase as well. Image below is sample only, counts and ranks are outdated and do not reflect the current votes. See the actual page for current stats. In the near future, I hope to say: We've actually been transfixed by it since the election began over in the election chat room. Be warned, it can be addicting (If you were witness to the intensity in the first 24 hours, you understand; fortunately for us all the voting activity has calmed down now). I had originally kept it private to the chat rooms to avoid hammering my poor web server with requests, but I think it will be OK. Please don't share the link outside of SO posts and such. While this post is obviously available to the public, I'd rather it didn't make it out to Twitter, etc. The application is easy on SO. The server scrapes the election page for vote counts once every 5 seconds and caches them locally. The web page reads the server-cached data. There's also a version that attempts to look more like SO, although I prefer the Geocities look myself. Source is on GitHub. Please don't make fun of it. Also, poke has a really awesome user script that generates a static version of this table right in the stats page. Check it out! Check out Undo's live vote monitor as well! watch -cd -n5 "curl -s http://disorient.ddns.net/SOVoteMonitor/raw | column -ts '\"'"
I'd prefer you use the web interface instead of the raw output for general watching, however, as it's a bit less bandwidth. If you find yourself motivated to create a new front-end, or have any other use, /SOVoteMonitor/votes?t=c and /SOVoteMonitor/votes serve JSON data; the former serves a list of candidates sorted by user ID (this will never change and should only be queried once), the latter serves the current vote counts in the same order as the candidate list. The r field in both is the current server application version. The e field in /votes?t=c is the timestamp of the end of the primary elections. The s field in /votes is the data serial number, updated by server when vote counts changed. If s=<serial> is specified to /votes you'll get a 304 if the data hasn't changed. This helps minimize bandwidth. If you don't want to deal with 304's, don't pass s. s=0 is guaranteed to get a response. The w field in /votes, if present, is an array of indexes into the original candidate info list of candidates who have withdrawn. Version 16: Updated URLs for November 2015 election. GitHub source still on 14. 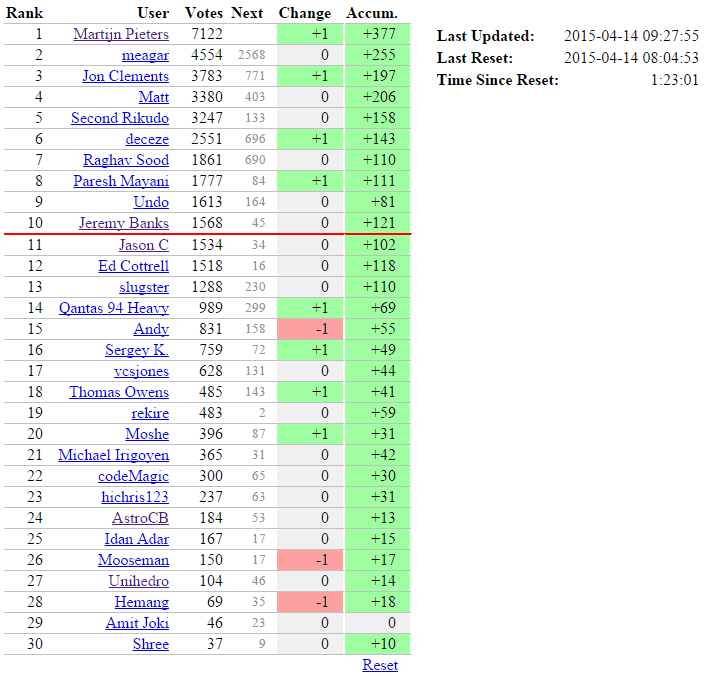 Version 14: Sloppily stop querying for updates after primaries end. Version 13: Candidates who have withdrawn are now indicated. Version 11: Added countdown timer! Also links to the no-longer-top-secret styles. Sorry about the momentary down time. Version 8b: Added SO-style styling but I kind of like the current version better; so if you add the top secret style=so parameter, you'll get it. Also try style=astro. Version 8: "Accum" saved in local storage across page refreshes (when supported), hopefully will no longer discourage folks to refresh page when update is made. Selected interval saved as well. Also no more new JSESSIONID cookies; it was a waste of bandwidth. Version 7: Add data versioning and 304 responses, add dropdown to select interval (thanks MichaelT for suggestions). Also added "show debug info" at bottom. Version 6: Added election info links. Yes, I am aware that the sort is unstable and tied candidates swap places. It's part of the excitement. Can I see the 10 candidates in the primary that would proceed to election phase? Only 10% voted this time, How to increase total number of votes/ voters in next election? Was this a bad question? Moderator Election, Why considering reputation to pick up the top 30?